I don't know why I can't walk away from them when I see them in the store. I tell myself not to look, but I do anyway. And then I grab them up at the last minute and run to the checkout...before I can change my mind. I talk to myself all the way home when I buy them.....questioning my impulsive purchase...stating over and over that I will return them. But I never do. 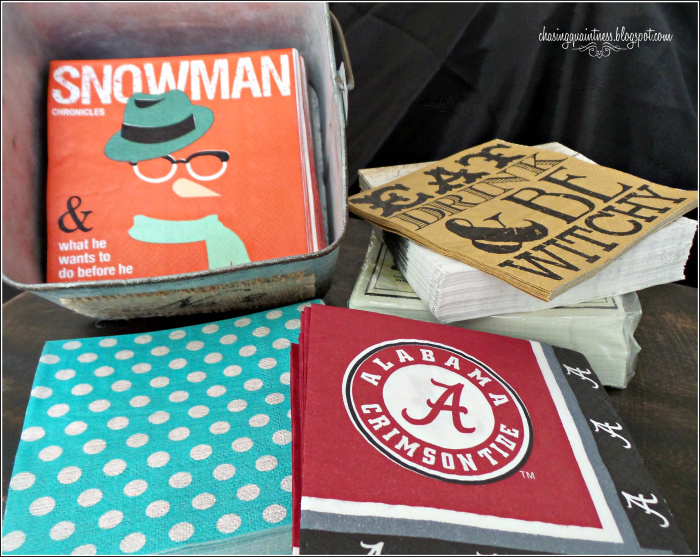 I just couldn't resist the Snowman Chronicles napkin!! Who besides me wants to know what he might do before he melts away??!! These are perfect for a "just because" cocktail party? Doesn't everyone need 12 different packs of Halloween napkins? 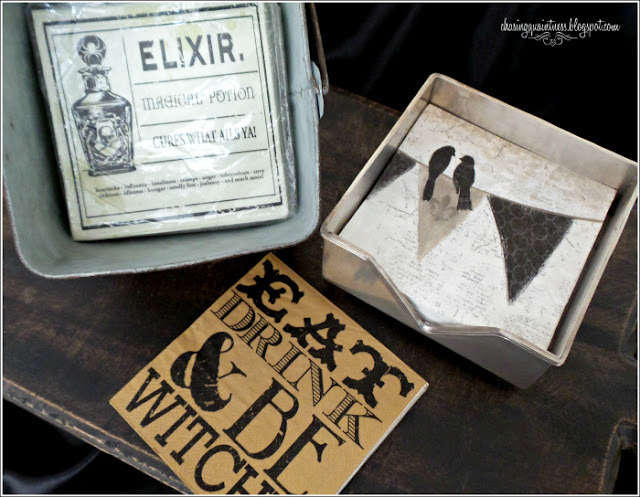 ....I'm sorry to say I have an additional 10 packs in the Halloween decoration box....all different designs! Football team napkins are a must during the fall!! As are the fall napkins! 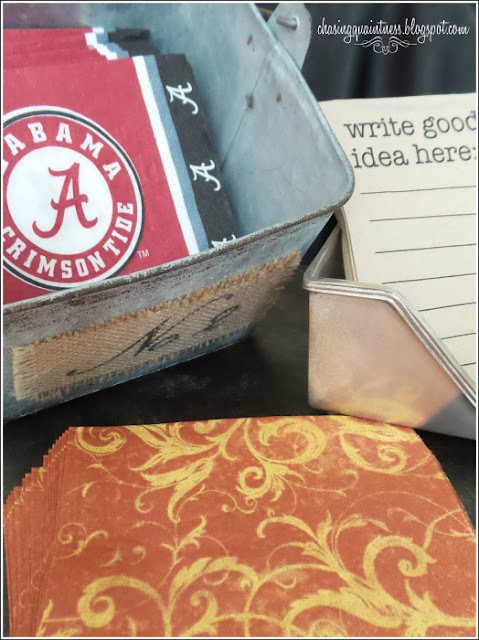 ;-) No, I'm not ignoring the hubster's choice of football teams...there are no Aggie napkins to be found anywhere! I know I'm not the only one out there with this little problem....so share what type of napkins you impulsively, or thoughtfully, buy! Oh you are so cute!!!! No, I have never seen anyone say they can not resist cocktail napkins. You are the very first. Oh my, by this, I am in no way diminishing any real "12 Point Programs" !!!!! -sigh- We have to be so careful, not to make light of something, which may be a life saver, for someone else. So if this offended anyone, among the readers here, I apologize. I know...my comments and jokes are never meant to be malicious or downplay any serious issues or anything else, but everything has gotten so out of hand, it's hard to just joke around anymore! You are so sweet and adorable Tessa! Hugs!! LOL…isn’t it crazy!! Lately, it’s like I look for them when I don’t need to be looking. I will think, “I’m just going to take a peek” and I end up with 7 packages…LOL. And you are so right, they are easy to tuck into a gift basket. The napkin problem has replaced a problem I used to have…scented drawer liners…LOL. HUGS!!! Yes, it is definitely okay! :-) We have finally gotten moved in…after moving the entire weekend. We still do not have internet service there but are looking into some alternatives. Everything is closed today for the holiday. We are here at the old house picking up some remnants and will be doing so all week. It seems moving is a never-ending process! :-) Hope you had a great weekend! I have never heard of this addiction. LOL! But it is a cute one. I love all your cocktail napkins.....never thought of them much before. Maybe you could start a club. I may have to jump on this bandwagon. I love the vintage napkins as well and have a little collection of those....all these little secrets I have...LOL. And yes, the 12 is definitely what I need !! :-) We've been moving since Friday....I'm so over it...LOL Hope you had a great weekend!! HUGS!! So many cute napkins are available anymore, who can resist? And isn't fun to have the cutest cocktail napkins on the block?! I can never resist, at all! I think they are all just adorable and you are so right! I love having something interesting and cutesy to pull out at a little get together….it makes for great conversation! Do what I do and blame it on Book Club! I mean, you can't use the same design more than once because the really cute ones are so memorable. I wouldn't say I need a twelve-step program yet, but I see how these can become "addictive". Yours are all so cute! LOL....you are sooooo right!! You have to have something different for book club each time! Definitely don't want the girls to get bored with the same old cocktail napkins! :-) Thanks so much! 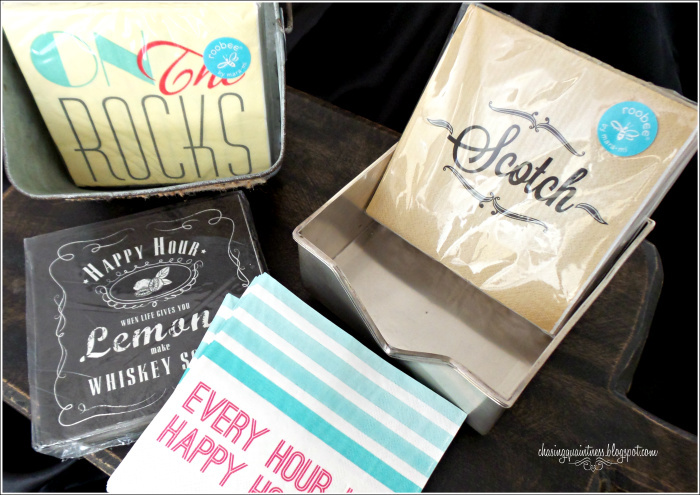 They are cute and inexpensive and I love giving them as gifts as well! We always use up all the Christmas napkins, so I will be buying plenty this year!  I have quite a few of those baskets myself! :-) Hope you had a wonderful weekend! Oh my you certainly DO have a collection and all so cute!! Tooo funny Benita. You have a great collection of napkins. You are ready if any one needs a napkin!!!! Have a great week end getting ready for the move. Most definitely! I am short on a few holidays (Christmas, Valentine’s, St. Patrick’s Day, etc.) but plan on making up for it! We have been moving all weekend and still have no internet…hopefully I can get a post up within the next week! :-) Hope you’ve had a marvelous weekend!! i'd say you deserve every cute cocktail napkin you can get your hands on. you're lucky you didn't turn into a raging alcoholic! LOLOLOL!!!!! so ... i say... ENJOY those napkins instead! LOL....I'm surprised I haven't been chugging them back all week!! :-) It has been a mess, but you were so right, this little house needed us and we have enjoyed it these past 2 days....we are still moving the little stuff, but the big things are in and I'm hoping to be using some of these napkins with the neighbors this weekend! Hope you've had a wonderful holiday weekend! I love these little cocktail napkins and have another entire stash of cloth napkins. The hubster always wants to know “how many kinds of napkins does one person need?” My answer is that there are never enough napkins of any kind! :-) I always try to get them on sale, that way I don’t feel so bad about us using them up! :-) Hope you’ve had a fabulous weekend!! We are moved, finally, and only have the small stuff to get and carry to the new house! Hope you’ve had a fabulous weekend!! Hugs!!! This is a totally new addiction to me and a very interesting thing to collect!! I see the appeal though. Do you actually use them or just keep them all packaged up? I stopped buying candles because I can't bear to burn them and wear them away! We all have our quirks, don't we??!! I totally get the candle problem, as I do that also. They are just too pretty to burn! I do use these napkins and am always buying more to replace them. Sometimes I kick myself because I don't buy the entire stash of the really cute ones, like the snowman napkins....those are just my most favorite for some reason! I knew I liked you, Benita! I'm a napkin horder, too. Not just cocktail, but guest towels, too. But, I think you do have a bigger collection than me! Oh My Gosh Benita, I actually don't feel like a napkin hoarder after reading your post! I think that I secretly want to live Martha Stewarts life and host countless cocktail parties, with tons of fancy finger foods that we will need countless fancy/humorous napkins for! Have a wonderful long weekend friend and good luck with the move!! The snowman is my favorite also and I’m so mad at myself for not buying them all. I will have to wait until December to see if HomeGoods will have anymore!  I’ve told Edward he better not open my last pack!  I’ve always wanted to be Martha also….and have tons of parties with all those fabulous people over and wonderful appetizers and dinners and then have those great Halloween parties! 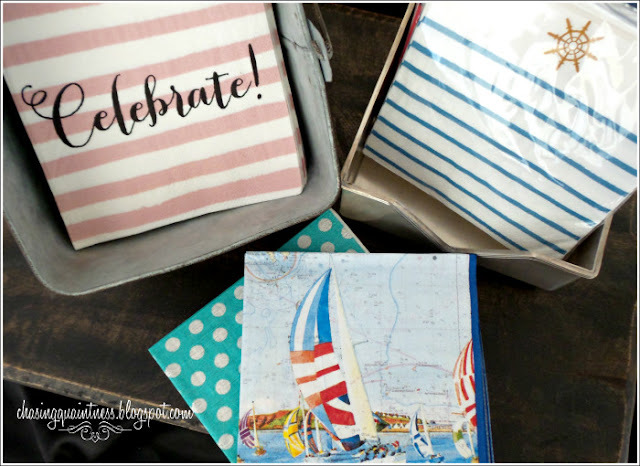 LOL I’ve already chatted with our next door neighbor about having our first get together in a few weeks, so I will need to buy some new napkins for that….LOL. Thank you so much…we are moved and are picking up the small stuff….but the major part is over…thankfully!!! Hope you’ve had a wonderful weekend!! lol! do you at least use them? or are they all off-limit? I currently have no obsessions. but it took me a while to get there. something to do with being on the road a lot, I guess. and who knows how long it lasts. LOL-at least they do not take up too much space and you could use them for projects too! Let's hope you don't become obsessive about vintage cloth cocktail napkins, Benita! Have you seen the prices on them? I was lucky enough to be given a set of pretty cloth ones when I bought a special seafood tablecloth and napkins on eBay a few years ago. They are so darling that I thought I'd collect more. Nope, the darn things are pricey. Maybe you'll find some of them when you get around to visiting that big antique mall when you move. Love to you on this Labor Day weekend and many good wishes for a good move! Thank you so much Dewena! I hope you’ve had a wonderful Labor Day weekend!! I’ve obsessive about all of these things for some reason and yes, they are so expensive. I try to find them in thrift stores so that I can pay a cheaper price. But I’ve noticed that they are a little pricey even in thrift stores. People are figuring it out, just like they did with teacups and the price on those things will never go down…LOL. As soon as we get settled, I want y’all to come over for dinner! !